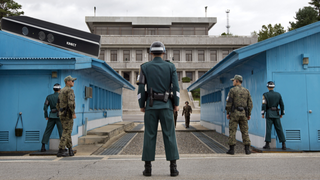 North Korea and South Korea are separated by the most heavily armed border on Earth. But rest easy, there's a new guard on the lookout: Kinect. Self-taught South Korean programmer Jae Kwan Ko developed a Kinect-based software system to monitor the DMZ (Demilitarized Zone), which separates the two countries. It was deployed at the border last August, but its existence wasn't made public until recently. According to news site Hankooki (via tipster Sang), the Kinect-based system identifies objects crossing the DMZ. It can discern the difference between animals and humans. If the system detects a human, it will alert the nearby outpost. Further details are sparse—probably, because this involves national security. "I've never even thought of a game system performing national defense tasks," Ko is quoted as saying. In the future, Ko says the sensor will detect heart rates and heat—which sounds like the DMZ's Kinect guard will be upgraded to the Xbox One version. The Xbox One has yet to be released in South Korea.